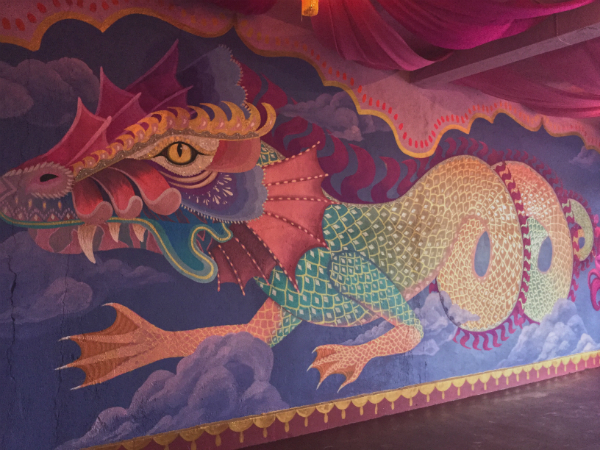 If you come across a striking mural of a mythical sea creature at Sassoon Docks while examining the artworks that are part of St+Art Mumbai Festival, you’ll find yourself stopping dead in your tracks, mulling over whether you just saw an eye twitch or a scale glisten. For that’s how realistically artists Curiot and Romina Romanelli have breathed life into their wild imagination. 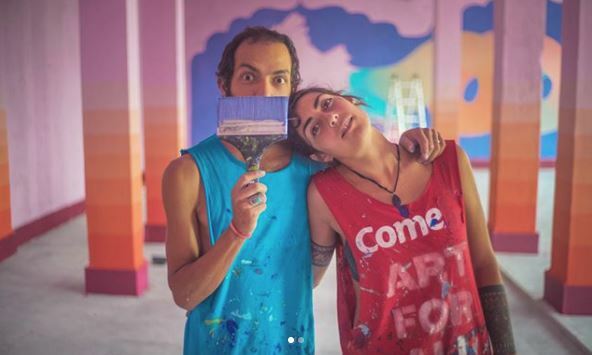 We caught up with the duo while they were still exuding the delightful smell of paint and had only just gotten rid of the last vestiges of the vivid hues rendered onto their art. What was the idea behind your artwork? Both: The festival organizers informed us that the subject was the aquatic mythology of Mumbai since we were at the docks, so we read up on it and created our own character called Shunya. We also constructed a fake museum around it to take our vision of building a magical world further. Can you tell us a little about the processes involved? Both: After the initial inspiration and the brainwave of having a museum, we went out to explore the streets, markets and temples of Mumbai to get better acquainted with the reality outside our workspace. While that lit up our creative console, the truth is that the installation was pretty spontaneous — we didn’t have a single sketch until it all came together. Romina: I’ve been fascinated by all kinds of art my whole life. I chose to study it as a subject in high school and then took up design at a Fine Arts University. I have dedicated a greater amount of time to pictorial arts, and recently to murals since the last four years. Curiot: Ever since I can remember, I have loved drawing but it wasn’t until my early twenties that I became interested in learning more about art. What were your first works as artists? Romina: My first serious artworks were in 2013 and 2014 when I did some solo travelling across Latin America as a backpacker and painted a few stores, hostels and houses in Bolivia, Peru and Colombia. Curiot: It would have to be my first solo show – ‘120v ~60htz’. Romina: Through my profession, I get to touch people and reach out behind their masks and fears through positive emotions. It empowers me to open a gate to something bigger than ourselves and plant the curiosity for things that are beyond the mundane. Curiot: For me, it’s about connecting with souls, exchanging ideas, transmitting positive energy and inspiring change. Both: We paint with the joint ideal of giving something larger than an image to society; we seek to improve the energy of a place or a group of people. It’s why we like to work together — we are built the same way so everything flows seamlessly. Romina: I love watching other artists’ works – I enjoy so many artworks that I can’t keep count – but I am more inspired by friends who are artists. 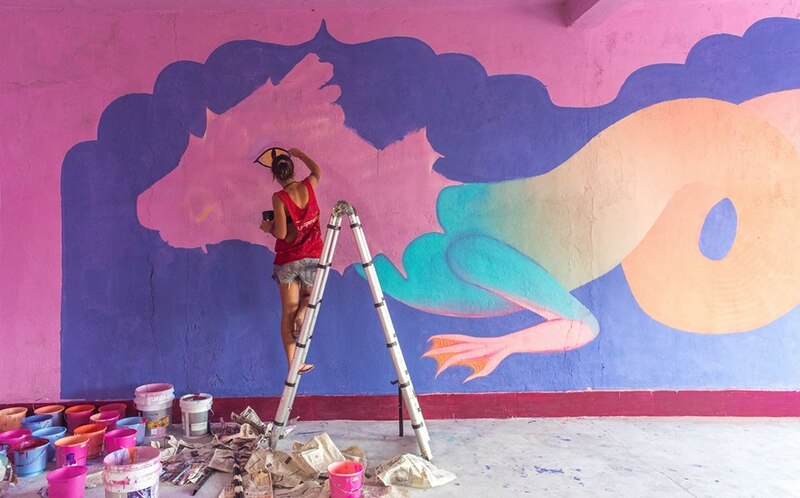 The way street art is progressing in Latin America is incredible; the residents look at art as a way of integration, teaching and healing society. In terms of aesthetic, I am moved by the past — I like the art nouveau movement of the 1900s, especially Alphonse Mucha and Gustav Klimt. I also personally identify with Leonora Carrington, Remedios Varo and Frida Kahlo. Curiot: I don’t really have a predilection for a specific artist at the moment. I learn from the places that I visit and my experiences during my time there.